THE Europa mail steam-ship, which arrived during the week from the United States, has brought the lamentable intelligence of her having, while on the homeward voyage, run down the brig Charles Bartlett, which was on her passage from London to New York, when 135 persons perished, a few only being saved. The accident occurred on the 27th ult., in latitude 50.49 and longitude 29.30. None of the watch were among the rescued. From the statement of the captain (Mr. W. Bartlett) of the ill-fated vessel, which was a first-rate ship, of 400 tons register, it appears that she left the Downs from London, bound to New York, on the 14th of June, with a general heavy cargo, of about 450 tons weight, and 162 passengers in the steerage, one cabin passenger, and 14 souls of the crew. On the 27th, at one o'clock in the afternoon, a dense fog set in. "At three o'clock," observes the captain, "I ordered a good look-out from the top-gallant forecastle; also directed the man at the wheel to look sharp to windward. At 3.30, P.M., being on the weather side of the poop deck, heard a rumbling to windward like distant thunder; turned my ear to the windward and my eye to the horizon; the man at the wheel noticing that I was listening, looked to windward and cried out "Sail, ho!" I at once saw what I supposed was a ship about one point forward of our beam, about four hundred yards distant. I ordered the helm up, thinking, if she did not discover us, that we should have time to clear her before she could come into contact. All hands shouted at the same time to alarm the ship, and I ordered the bell to be rung, and called to the ship to port her helm, as I saw that that was the only chance of escape. There were nearly one hundred passengers on deck at the time. All was of no avail; for in one minute from the time we saw the ship she was upon us, going at the rate of twelve knots, striking us abreast of the after main shrouds. The crash and the terrible scene which ensued I am not adequate to describe. I was knocked to leeward with the man at the wheel. I recovered myself in a moment, shouting for every person to cling to the steamer as their only hope. I caught hold of a broken chain on the bow and hauled myself up, shouting at the same time to the crew and passengers to follow. I had barely time to get on the steamer's bow; and while getting up, I noticed that her bow was into the ship within a foot of the after hatch, and that she was stove clear to the lee side, and that full twenty feet of her side was stove in. There must have been nearly 50 persons killed by the collision; and every exertion was made by Captain Lott, his officers, and crew, and the passengers on board the steamer. The boats were lowered as soon as possible; unfortunately only about ten were saved by the boats; the balance, making thirty-three more or less, saved themselves by hanging to the bow. The steamer lay by the scene as long as there was any hope of saving any. "Of the crew, Mr. Thomas Parker, of Charleston, S.C., aged twenty-two years; George Parsons, of Portland, Maine, aged eighteen years; and William Rich, of Gravesend, England, aged twenty-five years, were lost. A list of the passengers and crew saved has been published. We were most hospitably entertained by the captain, officers, and passengers of the steamer. "I will notice that all due exertion was used by Captain Lott, and officers and crew of the Europa, as well as all the passengers. I particularly observed one passenger using the most noble exertions; I saw him let himself overboard and clench a man in his arms, and, finding him dead, let him go. I next saw him on the bow of a boat, hauling a man from under water with a boat-hook, who was afterwards restored to life on board. I afterwards found that person to be Capt. R. B. Fowler, of Boston:"
The passengers of the Europa appointed a committee to investigate the cause of the collision, who reported as follows: "The undersigned, having weighed all the circumstances of this painful and unparalleled disaster, whereby about 136 souls found an untimely grave, feel bound to report that no blame can be attached to either party." "We feel convinced that everything was done by the commander, the officers, and the crew of the Europa to prevent the lamentable disaster, and everything tried after its occurrence to save lives and to minister to the comforts of the survivors." The Europa sustained but little damage, and none of the passengers or crew were injured. Upwards of £350 were collected on board that vessel for the relief of the survivors. EXTRACT FROM THE LOG OF THE "Europa" - The log-book of the Europa corroborates the above statement in the most important particulars: - "June 27, 1849. -Sea account. Commences with moderate breezes and a dense fog. Set starboard foretopmast studding sail. At 3.30 dense fog; could not see further than the ship's length ahead. A sail was reported by the look-out ahead. 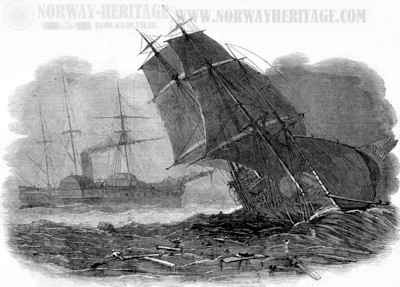 The helm was put hard-a-port and the engine stopped, but before we could clear we struck her between the main and mizzen rigging, and in about four minutes from the time she was first seen she went down. Boats were immediately down. Altogether forty-two persons were saved of the crew and passengers. She proved to be the Charles Bartlett, of Plymouth, United States, Captain Bartlett, from London, bound to New York, with 162 passengers and fourteen men. In sinking she took away our head knees and foretopmast. The boats pulled round the pieces of the wreck until satisfied no more lives could be saved. At 4, thick weather. At 4.30, set on the engines:"
The British and North American Royal Mail Steam-Packet Company [Cunard Line] have voluntarily intimated to the Mayor of Liverpool their intention of forwarding, free of charge, by their next two steamers to America, the persons saved from the wreck.